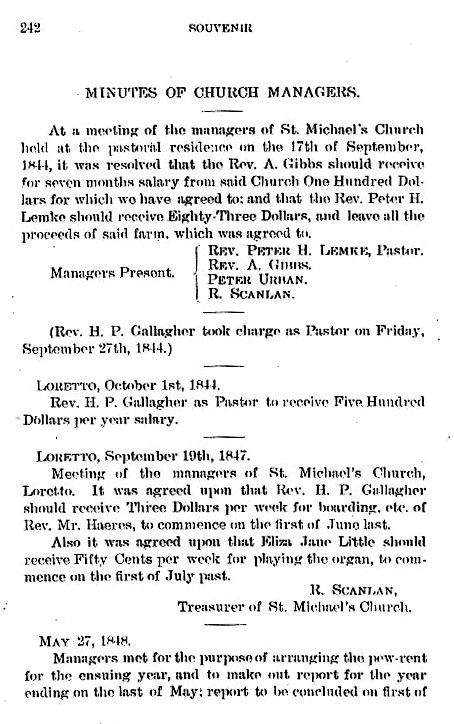 At a meeting of the managers of St. Michael's Church held at the pastoral residence on the 17th of September, 1844, it was resolved that the Rev. A. Gibbs should receive for seven months salary from said Church One Hundred Dollars for which we have agreed to; and that the Rev. Peter H. Lemke should receive Eighty-Three Dollars, and leave all the proceeds of said farm, which was agreed to. Managers Present: Rev. Peter H. Lemke, Pastor. Rev. H. P. Gallagher as Pastor to receive Five Hundred Dollars per year salary. Meeting of the managers of St. Michael's Church, Loretto. It was agreed upon that Rev. H. P. Gallagher should receive Three Dollars per week for boarding, etc. of Rev. Mr. Haeres, to commence on the first of June last. Also it was agreed upon that Eliza Jane Little should receive Fifty Cents per week for playing the organ, to commence on the first of July past. Treasurer of St. Michael's Church.